by Chris Woodford. Last updated: November 17, 2018. There's nothing quite like opening the door and breathing fresh, clean, air—but how clean is the air you're breathing right now? Unless you're a scientist with a chemistry lab at your fingertips, there's no real way of knowing. The gases you're sucking up through your nose could be slowly killing you: according to the World Health Organization, around 4.2 million people die prematurely from the effects of polluted, outdoor air every single year. Air pollution is a huge problem—and not just for people living in smog-choked cities: through such things as global warming and damage to the ozone layer, it has the potential to affect us all. So what exactly causes this major environmental issue and what can we do about it? Let's take a closer look! Photo: Air pollution is obvious when it pours from a smokestack (chimney), but it's not always so easy to spot. 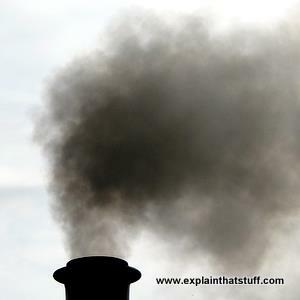 This is an old photo of the kind of smoke that used to come from coal-fired power plants and, apart from soot (unburned carbon particles), its pollutants include sulfur dioxide and the greenhouse gas carbon dioxide. Thanks to tougher pollution controls, modern power plants produce only a fraction as much pollution. As with water pollution and land contamination, it's the quantity (or concentration) of a chemical in the air that makes the difference between "harmless" and "pollution." Carbon dioxide (CO2), for example, is present in the air around you at a typical concentration of less than 0.05 percent and breathing it in usually does no harm (you breathe it out all day long); but air with an extremely high concentration of carbon dioxide (say, 5–10 percent) is toxic and could kill you in a matter of minutes. Since Earth's atmosphere is very turbulent—many of us live in windy countries—air pollution will often disperse relatively quickly. In less enlightened times, factory operators thought that if they built really high smokestacks, the wind would simply blow their smoke away, diluting and dispersing it so it wouldn't be a problem. The only trouble was, Earth is a much smaller place than we think and pollution doesn't always disappear so conveniently. 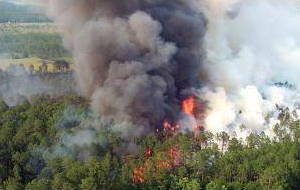 Photo: Forest fires are one completely natural cause of air pollution. We'll never be able to prevent them breaking out or stop the pollution they cause; our best hope is to manage forests, where we can, so fires don't spread. Photo by courtesy of US Fish and Wildlife Service. When we think of pollution, we tend to think it's a problem that humans cause through ignorance or stupidity—and that's certainly true, some of the time. However, it's important to remember that some kinds of air pollution are produced naturally. Forest fires, erupting volcanoes, and gases released from radioactive decay of rocks inside Earth are just three examples of natural air pollution that can have hugely disruptive effects on people and the planet. Forest fires (which often start naturally) can produce huge swathes of smoke that drift for miles over neighboring cities, countries, or continents. Giant volcanic eruptions can spew so much dust into the atmosphere that they block out significant amounts of sunlight and cause the entire planet to cool down for a year or more. Radioactive rocks can release a gas called radon when they decay, which can build up in the basements of buildings with serious effects on people's health (each year, around 21,000 people die of lung cancer, due to radon gas in the United States). All these things are examples of serious air pollution that happen without any help from humans; although we can adapt to natural air pollution, and try to reduce the disruption it causes, we can never stop it happening completely. For the rest of this article, we'll consider only the "unnatural" types of pollution: the problems that people cause—and the ones we can solve. Photo: Flying molecules—if you could see air pollution close up, this is what it would look like. 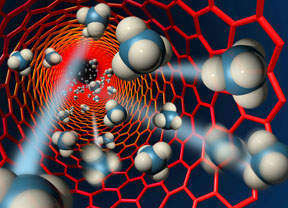 Image courtesy of US Department of Energy. Sulfur dioxide: Coal, petroleum, and other fuels are often impure and contain sulfur as well as organic (carbon-based) compounds. When sulfur (spelled "sulphur" in some countries) burns with oxygen from the air, sulfur dioxide (SO2) is produced. Coal-fired power plants are the world's biggest source of sulfur-dioxide air pollution, which contributes to smog, acid rain, and health problems that include lung disease. Carbon dioxide: This gas is central to everyday life and isn't normally considered a pollutant: we all produce it when we breathe out and plants such as crops and trees need to "breathe" it in to grow. However, carbon dioxide is also a greenhouse gas released by engines and power plants. Since the beginning of the Industrial Revolution, it's been building up in Earth's atmosphere and contributing to the problem of global warming and climate change. Nitrogen oxides: Nitrogen dioxide (NO2) and nitrogen oxide (NO) are pollutants produced as an indirect result of combustion, when nitrogen and oxygen from the air react together. Nitrogen oxide pollution comes from vehicle engines and power plants, and plays an important role in the formation of acid rain, ozone and smog. Nitrogen oxides are also "indirect greenhouse gases" (they contribute to global warming by producing ozone, which is a greenhouse gas). Volatile organic compounds (VOCs): These carbon-based (organic) chemicals evaporate easily at ordinary temperatures and pressures, so they readily become gases. That's precisely why they're used as solvents in many different household chemicals such as paints, waxes, and varnishes. Unfortunately, they're also a form of air pollution: they're believed to have long-term (chronic) effects on people's health and they also play a role in the formation of ozone and smog. Particulates: These are the sooty deposits in air pollution that blacken buildings and cause breathing difficulties. Particulates of different sizes are often referred to by the letters PM followed by a number, so PM10 means soot particles of less than 10 microns (10 millionths of a meter or 10µm in diameter, roughly 10 times thinner than a thick human hair). The smaller ("finer") the particulates, the deeper they travel into our lungs and the more dangerous they are. PM2.5 particulates are much more dangerous (they're less than 2.5 millionths of a meter or about 40 times thinner than a typical hair). In cities, most particulates come from traffic fumes. Ozone: Also called trioxygen, this is a type of oxygen gas whose molecules are made from three oxygen atoms joined together (so it has the chemical formula O3), instead of just the two atoms in conventional oxygen (O2). In the stratosphere (upper atmosphere), a band of ozone ("the ozone layer") protects us by screening out harmful ultraviolet radiation (high-energy blue light) beaming down from the Sun. At ground level, it's a toxic pollutant that can damage health. It forms when sunlight strikes a cocktail of other pollution and is a key ingredient of smog (see box below). Chlorofluorocarbons (CFCs): Once thought to be harmless, these gases were widely used in refrigerators and aerosol cans until it was discovered that they damaged Earth's ozone layer. We discuss this in more detail down below. Unburned hydrocarbons: Petroleum and other fuels are made of organic compounds based on chains of carbon and hydrogen atoms. When they burn properly, they're completely converted into harmless carbon dioxide and water; when they burn incompletely, they can release carbon monoxide or float into the air in their unburned form, contributing to smog. Lead and heavy metals: Lead and other toxic "heavy metals" can be spread into the air either as toxic compounds or as aerosols (when solids or liquids are dispersed through gases and carried through the air by them) in such things as exhaust fumes and the fly ash (contaminated waste dust) from incinerator smokestacks. Where, then, does modern air pollution come from? By far the biggest culprit today is traffic, though power plants and factories continue to make an important contribution. Before we start laying the blame for air pollution, let's remember one very important thing: most of us drive (or travel in) cars, use electricity, and buy goods made in factories. If we're pointing fingers, ultimately we're going to have to point them at ourselves. Now let's look a bit more closely at the three key sources of air pollution. There are over one billion cars on the road today—one for every two people in rich countries such as the United States. Virtually all of them are powered by gasoline and diesel engines that burn petroleum to release energy. Petroleum is made up of hydrocarbons (large molecules built from hydrogen and carbon) and, in theory, burning them fully with enough oxygen should produce nothing worse than carbon dioxide and water. In practice, fuels aren't pure hydrocarbons and engines don't burn them cleanly. As a result, exhausts from engines contain all kinds of pollution, notably particulates (soot of various sizes), carbon monoxide (CO, a poisonous gas), nitrogen oxides (NOx), volatile organic compounds (VOCs), and lead—and indirectly produce ozone. Mix this noxious cocktail together and energize it with sunlight and you get the sometimes brownish, sometimes blueish fog of pollution we call smog, which can hang over cities for days on end. Vehicles don't release pollution only from their tailpipes. Brake and tire wear and tear, the slow rubbing away of the road surface as tires rumble over it, and stirring up of the dust and debris on top of it also release significant amounts of PM10 and PM2.5 particulates into the air. 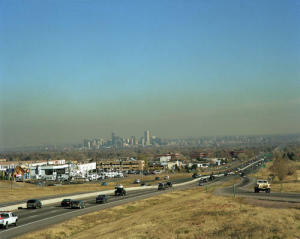 Photo: Brown smog lingers over Denver, Colorado. Photo by Warren Gretz courtesy of US Department of Energy/National Renewable Energy Laboratory. Smog isn't the stuff that pumps from a car's tailpipe or drifts from a factory smokestack—it's the nasty brown or blue haze that builds up over a city as a result. Smog (a combination of the words "smoke" and "fog") forms when sunlight acts on a cocktail of pollutant gases such as nitrogen and sulfur oxides, unburned hydrocarbons, and carbon monoxide; that's why it's sometimes called photochemical smog (the energy in light causes the chemical reaction that makes smog). One of the most harmful constituents of smog is a toxic form of oxygen called ozone, which can cause serious breathing difficulties and even, sometimes, death. When smog is rich in ozone, it tends to be a blueish color, otherwise it's more likely to be brown. Although smog can happen in any busy city, it's a particular problem in places such as Los Angeles where the local climate (influenced by the ocean and neighboring mountains) regularly causes what's known as a temperature inversion. Normally, air gets colder the higher up you go but in a temperature inversion the opposite happens: a layer of warm air traps a layer of cold air nearer the ground. This acts like a lid over a cloud of smog and stops it from rising and drifting away. Largely because of their traffic levels, smog afflicts many of the world's busiest cities, including Athens, Beijing, Delhi, Madrid, Mexico City, Milan, Paris, and Tokyo. 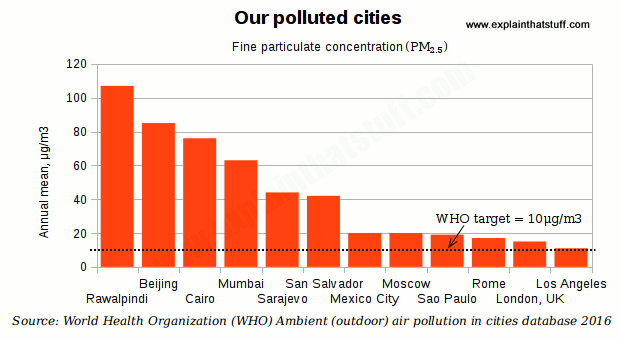 Chart: Most of the world's major cities routinely exceed World Health Organization (WHO) air pollution guidelines. This chart compares annual mean PM2.5 levels in 12 representative cities around the world with the WHO guideline value of 10μg per cubic meter (dotted line). PM2.5 particulates are those smaller than 2.5 microns and believed to be most closely linked with adverse health effects. Chart drawn using data from Ambient (outdoor) air pollution in cities database 2016 courtesy of World Health Organization, which was the newest available data at the time this article was last checked and updated (November 2018). Although traffic, power plants, and industrial and chemical plants produce the majority of Earth's manmade air pollution, many other factors contribute to the problem. In some parts of the world, people still rely on burning woodfuel for their cooking and heating, and that produces indoor air pollution that can seriously harm their health (solar cookers are one solution to that problem). In some areas, garbage is incinerated instead of being recycled or landfilled and that can also produce significant air pollution unless the incinerators are properly designed to operate at a high enough temperature (even then, there is a toxic residue left behind that must be disposed of somehow). What effects does air pollution have? Air pollution can harm the health of people and animals, damage crops or stop them growing properly, and make our world unpleasant and unattractive in a variety of other ways. We know air pollution is a bad thing without even thinking about it. Have you ever coughed when a truck drove past belching out its sooty exhaust? Instinctively, you cough to clear your lungs and protect your body and you might even cover your face with your handkerchief or sleeve to filter the air until it feels safe to breathe deeply again. You don't have to be told that pollution like this might harm your health to want to steer clear of it: your body takes action automatically. The only trouble is, we can't always see or smell air pollution, tell when it's affecting us, or know how it might harm us days, months, or even years in the future. Photo: Air pollution can cause a variety of lung diseases and other respiratory problems. 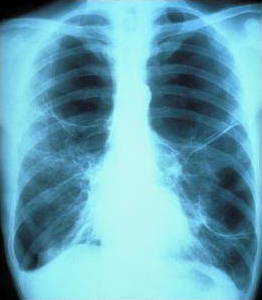 This chest X ray shows a lung disease called emphysema in the patient's left lung. A variety of things can cause it, including smoking and exposure to air pollution. Photo courtesy of National Heart, Lung and Blood Institute (NHLBI) and National Institutes of Health. Sometimes the connection between air pollution and human health is obvious, as in the Bhopal Disaster. Another notable incident happened in London, England in 1952 when thick, deadly pollution known as the Great Smog, caused by people burning coal in home fires and coal-fired power plants, killed an estimated 4000 people. Other times, it's much more difficult to make the link. Some estimates suggest perhaps 10–20 percent of cancers are caused by air pollution of one kind or another, but cancers can take a long time to develop and many other things can cause them too. Proving a direct link with a particular kind of air pollution (say, a garbage incinerator in your community or a neighbor who persistently burns plastic on garden bonfires) is very difficult. "In 2016, 91% of the world population was living in places where the WHO air quality guidelines levels were not met." According to the World Health Organization (WHO), air pollution is one of the world's biggest killers: it causes around four million people to die prematurely each year. Many of these deaths happen in developing countries (over half a million in India alone), but wealthier industrial nations suffer too: in the United States, for example, around 41,000 people a year are estimated to die early because of air pollution. Imagine how much media coverage there would be if several million people (that's roughly the population of Houston, Texas or the West Midlands conurbation in England) were killed in a terrorist incident or an earthquake. Because air pollution kills quietly and relentlessly, and its finger is hard to detect on the trigger, people barely seem to notice—or care. Deaths aren't the only human consequence of air pollution. For every person who dies, hundreds or thousands more suffer breathing problems such as asthma and bronchitis. Workers exposed to high levels of dust sometimes suffer years of misery before dying from illnesses such as silicosis. Farming is as much of an art as a science; crops can thrive—or fail—for all sorts of reasons. One of the things that characterized the 20th century was the huge growth in industrial agriculture—using fertilizers, pesticides, and so on to increase crop yields and feed the world's ever-growing population. These aren't the only chemicals that crops are exposed to, however. We know that air pollution (in common with water pollution) can seriously affect the growth of plants. At one end of the spectrum, it's easy to find chemical residues (everything from toxic heavy metals such as lead to cocktails of brake fluids and other chemicals) in plants that grow alongside highways. At the opposite extreme, the huge increase in atmospheric carbon dioxide now causing global warming and climate change is expected to have a major impact on the world's agriculture (reducing crop yields in some places but potentially increasing yields elsewhere). 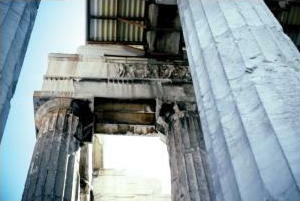 Photo: The stonework on the Parthenon in Athens, Greece has been blackened by particulates from traffic pollution. Photo by courtesy of U.S. Geological Survey. Wander the streets of a big city and you'll notice quite quickly how dirty the buildings look, even in areas where there are no factories or power plants. Exhaust fumes from traffic are generally to blame. Apart from blackening buildings with soot, they also contribute to acid rain (see below) that can wear away stonework in a matter of years or decades. Air pollution can happen on every scale, from the local to the global. Sometimes the effects are immediate and happen very near to the thing that caused them; but they can also happen days, months, or even years later—and in other cities, countries, or continents. Have you ever sat on a train with someone who suddenly decided to start cleaning or varnishing their nails? Acetone (a solvent in nail varnish remover) is a VOC (volatile organic compound), so it evaporates and spreads very quickly, rapidly getting up the nose of anyone sitting nearby. Open a can of gloss paint in your home and start painting a door or window and your house will very quickly fill with a noxious chemical stench—VOCs again! Grill some toast too long and you'll set the bread on fire, filling your kitchen with clouds of soot (particulates) and possibly setting off a smoke alarm or carbon monoxide detector. These are three everyday examples of how air pollution can work on a very local scale: the causes and the effects are close together in both space and time. Localized air pollution like this is the easiest kind to tackle. 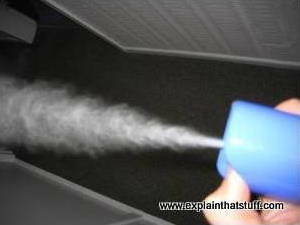 Photo: Air freshener—or air polluter? Detergents and household cleaners, aerosol sprays, shoe polish, hair wax, paints, and glues are just a few of the everyday chemicals that can release air pollution into your home. If you have a gas or oil-fired boiler or a coal- or wood- fired stove and it's not properly ventilated, it will generate dangerous and toxic (but colorless and odorless) carbon monoxide gas. Surprisingly, even the water that pipes into our homes can be a source of air pollution. Every time you heat water (on a stove, in a kettle, in a shower, or even when you're steam ironing clothes), you can evaporate VOC chemicals trapped inside and release them into the air. Even your shiny new shower curtain could be releasing VOCs if it's made from a type of plastic called PVC. Maybe your building has air conditioning? Chances are, the air it blows through has already circulated through other rooms in the same building or even other people's offices or apartments. Perhaps your building is located somewhere near a source of natural radioactivity so radon gas is slowly accumulating inside? Indoor air quality: Comprehensive information from the US Environmental Protection Agency (EPA). How clean your air is depends on where you live: air is generally far cleaner in rural than in urban areas, for example, where factories, chemical plants, and power plants are more likely to be located and traffic levels are much higher. Exactly how clean your neighborhood is can also depend critically on the weather, especially if you live somewhere prone to temperature inversions and smog. Neighborhood air pollution problems are often best tackled through local community campaigns. Tall smokestacks designed to disperse pollution don't always have that effect. If the wind generally blows in the same direction, the pollution can be systematically deposited on another city, region, or country downwind. Sometimes air pollution is carried back down to Earth as contaminated rain or snow, which dissolves in watercourses or oceans causing what's known as atmospheric deposition. In other words, the air pollution becomes water pollution. According to the US Environmental Protection Agency (EPA): "The air is a major source of chemicals affecting the health of the Great Lakes. Certain persistent air toxics may contribute not only to atmospheric pollution but to water pollution. These toxics can bioaccumulate in the food web [and] may endanger the environment, affecting the health of humans and wildlife." Acid rain (see box below) is the best known example of atmospheric deposition. It's often said that pollution knows no boundaries—and that's particularly true of air pollution, which can easily blow from one country or continent where it's produced and cause a problem for someone else. Air pollution that travels like this, from country to country, is called transboundary pollution; acid rain is also an example of this and so is radioactive fallout (the contaminated dust that falls to Earth after a nuclear explosion). When the Chernobyl nuclear power plant exploded in the Ukraine in 1986, wind dispersed the air pollution it produced relatively quickly—but only by blowing a cloud of toxic radioactive gas over much of Europe and causing long-lasting problems in a number of other countries (70 percent of the fallout landed on neighboring Belarus). When rain falls through polluted air, it can pick up some of the pollution and turn more acidic—producing what's known as acid rain. Simply speaking, the air pollution converts the rain into a weak acid. 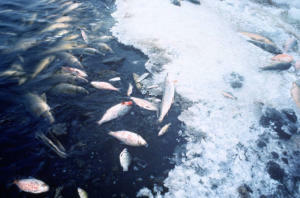 Photo: Acid rain can turn lakes so acidic that fish no longer survive. Picture courtesy of U.S. Fish and Wildlife Service Division of Public Affairs. Why does that matter? Pure water is neither acidic nor alkaline but completely neutral (we say it has an acidity level or pH of 7.0). Ordinary rainwater is a little bit more acidic than this with about the same acidity as bananas (roughly pH 5.5), but if rain falls through sulfur dioxide pollution it can turn much more acidic (with a pH of 4.5 or lower, which is the same acidity as orange or lemon juice). When acid rain accumulates in lakes or rivers, it gradually turns the entire water more acidic. That's a real problem because fish thrive only in water that is neutral or slightly acidic (typically with a pH of 6.5–7.0). Once the acidity drops below about pH 6.0, fish soon start to die—and if the pH drops to about 4.0 or less, all the fish will be killed. Acid rain has caused major problems in lakes throughout North America and Europe. It also causes the death of forests, reduces the fertility of soil, and damages buildings by eating away stonework (the marble on the US Capitol in Washington, DC has been eroded by acid-rain, for example). One of the biggest difficulties in tackling acid rain is that it can happen over very long distances. In one notable case, sulfur dioxide air pollution produced by power plants in the UK was blamed for causing acid rain that fell on Scandinavian countries such as Norway, producing widespread damage to forests and the deaths of thousands of fish in acidified lakes. The British government refused to acknowledge the problem and that was partly why the UK became known as "the dirty man of Europe" in the 1980s and 1990s. It's hard to imagine doing anything so dramatic and serious that it would damage our entire, enormous planet—but, remarkable though it may seem, we all do things like this everyday, contributing to problems such as global warming and the damage to the ozone layer (two separate issues that are often confused). Every time you ride in a car, turn on the lights, switch on your TV, take a shower, microwave a meal, or use energy that's come from burning a fossil fuel such as oil, coal, or natural gas, you're almost certainly adding to the problem of global warming and climate change: unless it's been produced in some environmentally friendly way, the energy you're using has most likely released carbon dioxide gas into the air. While it's not an obvious pollutant, carbon dioxide has gradually built up in the atmosphere, along with other chemicals known as greenhouse gases. Together, these gases act a bit like a blanket surrounding our planet that is slowly making the mean global temperature rise, causing the climate (the long-term pattern of our weather) to change, and producing a variety of different effects on the natural world, including rising sea levels. Read more in our main article about global warming and climate change. 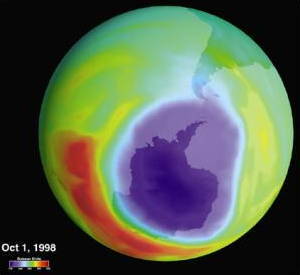 Photo: Global air pollution: The purple area is the huge hole in the ozone layer over Antarctica caused by CFC chemicals in aerosol sprays and refrigerants. Picture courtesy of NASA on the Commons. Global warming is a really dramatic effect of air pollution produced by humans, but that doesn't mean it's an insoluble problem. People have already managed to solve another huge air pollution problem that affected the whole world: the damage to a part of the atmosphere called the ozone layer. At ground level, ozone is an air pollutant—but the ozone that exists in the stratosphere (high up in the atmosphere), is exactly the opposite: it's a perfectly natural chemical that protects us like sunscreen, blocking out some of the Sun's harmful ultraviolet radiation. During the 20th century, people started using large quantities of chemicals called chlorofluorocarbons (CFCs), because they worked very well as cooling chemicals in refrigerators and propellant gases in aerosol cans (propellants are the gases that help to fire out air freshener, hair spray, or whatever else the can contains). In 1974, scientists Mario Molina and Sherwood Rowland suggested that chlorofluorocarbons attacked and destroyed the ozone layer, producing holes that would allow dangerous ultraviolet light to stream through. In the 1980s, huge "ozone holes" started to appear over Antarctica, prompting many countries to unite and sign an international agreement called the Montreal Protocol, which rapidly phased out the use of CFCs. As a result, the ozone layer—though still damaged—is expected to recover by the end of the 21st century. As we discovered in the last section, air pollution means different problems at different scales—in other words, it's not one single problem but many different ones. Solving a problem like passive smoking (how one person's cigarette smoke can harm other people's health) is very different to tackling a problem like global warming, though both involve air pollution and they do have some things in common (both problems, for example, require us to think about how our behavior can affect other people in the short and long term and to act more considerately). Generally, air pollution is tackled by a mixture of technological solutions, laws and regulations, and changes in people's behavior. It's very easy to criticize power plants, factories, and vehicles that belch polluting gases into the atmosphere, but virtually all of us rely on these things—ultimately, we are the people polluting. Solving air pollution is also a challenge because many people have a big investment in the status quo (carrying on with the world much as it is today). For example, it's easier for car makers to keep on making gasoline engines than to develop electric cars or ones powered by fuel cells that produce less pollution. The world has thousands of coal-fired power plants and hundreds of nuclear power stations and, again, it's easier to keep those going than to create an entirely new power system based on solar panels, wind turbines, and other forms of renewable energy (though that is happening slowly). Growing awareness of problems such as air pollution and global warming is slowly forcing a shift to cleaner technologies, but the world remains firmly locked in its old, polluting ways. Let's be optimistic, though. Just as technology has caused the problem of air pollution, so it can provide solutions. Cars with conventional gasoline engines are now routinely fitted with catalytic converters that remove some (though not all) of the pollutants from the exhaust gases. Power plants are fitted with electrostatic smoke precipitators that use static electricity to pull dirt and soot from the gases that drift up smokestacks; in time, it's likely that many older power plants will also be retro-fitted with carbon capture systems that trap carbon dioxide to help reduce global warming. On a much smaller scale, environmentally friendly people who want to ventilate their homes without opening windows and wasting energy can install heat-recovery ventilation systems, which use the heat energy locked in outgoing waste air to warm fresh incoming air. Technologies like this can help us live smarter—to go about our lives in much the same way with far less impact on the planet. 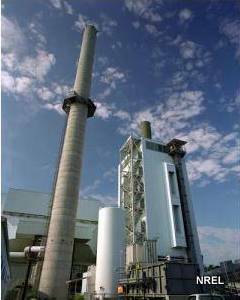 Photo: Pollution solution: an electrostatic smoke precipitator helps to prevent air pollution from this smokestack at the McNeil biomass power plant in Burlington, VT. Photo by Warren Gretz courtesy of US DOE National Renewable Energy Laboratory (NREL). By itself, technology is as likely to harm the environment as to help it. That's why laws and regulations have been such an important part of tackling the problem of pollution. Many once-polluted cities now have relatively clean air and water, largely thanks to anti-pollution laws introduced during the mid-20th century. In England, following the 1952 smog tragedy that killed thousands in the capital city of London, the government introduced its Clean Air Act of 1956, which restricted how and where coal could be burned and where furnaces could be sited, and forced people to build smokestacks higher to disperse pollution. In the United States, a series of Clean Air Acts were passed between the 1960s and 1990s. The 1990 Pollution Prevention Act went even further, shifting the emphasis from cleaning up pollution to preventing it ever happening in the first place. National laws are of little help in tackling transboundary pollution (when air pollution from one country affects neighboring countries or continents), but that doesn't mean the law is useless in such cases. The creation of the European Union (now comprising around 30 different countries) has led to many Europe-wide environmental acts, called directives. These force the member countries to introduce their own, broadly similar, national environmental laws that ultimately cover the entire European region. For example, the 1976 European Bathing Water Directive tried to enforce minimum standards of water quality for beaches and coastal areas across Europe to reduce pollution from sewage disposal, while the 1996 European Directive on Integrated Pollution Prevention and Control (IPPC) attempted to limit air and water pollution from industry. Other successful international laws include the Convention on Long-Range Transboundary Air Pollution (1979), which has helped to reduce sulfur dioxide emissions from power plants and, of course, the Montreal Protocol, which successfully brought 196 countries together to target ozone depletion. Unfortunately, attempts to control global warming through international laws and agreements have so far proved less successful. Clean technologies can tackle dirty technologies, and laws can make polluters clean up their act—but none of this would happen without people being aware of pollution and its damaging effects. Sometimes it takes horrific tragedies (like the 1952 smog episode in London or the Chernobyl catastrophe) to prompt action. Often, we pollute the environment without even realizing it: how many people know that taking a shower or ironing a shirt can release indoor air pollution from hot water that they immediately breathe in, for example? Helping people to understand the causes and effects of pollution and what they can do to tackle the issue is very important—that's why I'm writing these words now and probably why you're reading them. Air pollution isn't someone else's problem: all of us help to cause it and we can all help to clean it up. Starting now! Photo: Buying organic food reduces the use of sprayed pesticides and other chemicals, so it helps to reduce air (as well as water) pollution. So now you know the problems, but what's the solution? Here are ten simple things you can do that will make a difference (however small) to the problem of air pollution. Save energy: Making electricity in conventional power plants generates pollution, so anything you can do to save energy will help to reduce pollution (and global warming as well). Switch to low-energy lamps, use a laptop computer instead of a desktop, dry your clothes outdoors, and heat insulate your home. Sounds too worthy? Just remember this: every bit of energy you save also saves you money you can spend on something better! If you're not sure how you're wasting energy, use an electricity monitor to help identify your most inefficient appliances. Save water when you can: Producing cool, clean water needs huge amounts of energy so cutting water waste is another good way to save energy and pollution. Cut the car: Sometimes we have to use cars, but often we can get a bus or a train or (for shorter distances) walk or cycle. Cars are now the biggest source of air pollution in most urban areas, so traveling some other way through a town or city helps to keep the air clean. When you have to use your car, drive efficiently to save fuel and money, and cut pollution. It's particularly important to avoid car use when smog is bad in your city. Cut out garden bonfires: Did you know that a garden bonfire can contain up to 350 times as much of the cancer-causing chemical benzpyrene as cigarette smoke? Well you do now! Having a bonfire is one of the most selfish things you can do in your local neighborhood. Compost your garden refuse, bury it, or dispose of it some other way. Never burn household waste: If you burn plastic, you release horrible toxic chemicals into the local environment, some of which will be sucked up your own nose! Recycle your trash instead. Garden organically: Would you spray pesticides on your dinner? So why spray them on your garden? You can tackle virtually all garden pests and diseases in more environmentally friendly organic ways. 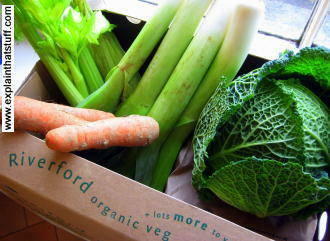 Buying organic food is a good option if you can't grow your own. Cut the chemicals: Do you really need to spray an air freshener to make your home feel nice? Yes, you fill your room with perfume, but you're also choking it with chemical pollution. Why not just open a window instead? How many of the chemicals you buy do you really need to use? Why not try cleaning with microfiber cloths instead of using detergents? Use water-based paints and glues: Avoid the nasty solvents in paints, varnishes, and wood preservatives. Remember that if anyone's going to suffer from the air pollution they create, you're first in line. Reduce, reuse, and recycle: Buying new stuff is fun, but reusing old things can be just as good. Don't smoke: Cigarettes contain an addictive chemical called nicotine that makes you want to go on smoking them. They cause all kinds of health problems, but they also cause very localized air pollution. Once again you're first in line. The Invisible Killer: The Rising Global Threat of Air Pollution and How We Can Fight Back by Gary Fuller. Melville House, 2018. Reducing Pollution and Waste by Jen Green. Raintree/Capstone, 2011. A 48-page introduction for ages 9–12. The emphasis here is on getting children to think about pollution: where it comes from, who makes it, and who should solve the problem. Pollution Crisis by Russ Parker. Rosen, 2009. A 32-page guide for ages 8–10. It starts with a global survey of the problem; looks at air, water, and land pollution; then considers how we all need to be part of the solution. Earth Matters by Lynn Dicks et al. Dorling Kindersley, 2008. This isn't specifically about pollution. Instead, it explores how a range of different environmental problems are testing life to the limit in the planet's major biomes (oceans, forests, and so on). I wrote the section of this book that covers the polar regions. Fundamentals of Air Pollution by Daniel Vallero. Addison-Wesley, 2014. Another huge (1000-page) guide suitable for undergraduates and older students. Introduction to Air Pollution Science: A Public Health Perspective by Robert F. Phalen and Robert N. Phalen. Jones & Bartlett Publishers, 2012. There is more of a medical emphasis in this book, which starts with a basic run-through of pollution science and history before moving on to public health topics such as toxicology, epidemiology, risk assessment, and ethics. Air Pollution by Abhishek Tiwary and Jeremy Colls. Routledge/Taylor and Francis, 2017. A very detailed (500-page) guide suitable for older students and general readers. Air Pollution: Its Origin and Control by Kenneth Wark, Cecil Francis Warner, and Wayne T. Davis. Addison-Wesley, 1998. A huge classic guide to pollution, now in its third edition. 90% of world's children are breathing toxic air, WHO study finds by Matthew Taylor. The Guardian, October 29, 2018. The air pollution affecting billions of children could continue to harm their health throughout their lives. Pollution May Dim Thinking Skills, Study in China Suggests by Mike Ives. The New York Times, August 29, 2018. Long-term exposure to air pollution seems to cause a decline in cognitive skills. Global pollution kills 9m a year and threatens 'survival of human societies' by Damian Carrington. The Guardian, October 19, 2017. Air, water, and land pollution kill millions, cost trillions, and threaten the very survival of humankind, a new study reveals. India's Air Pollution Rivals China's as World's Deadliest by Geeta Anand. The New York Times, February 14, 2017. High levels of pollution could be killing 1.1 million Indians each year. More Than 9 in 10 People Breathe Bad Air, WHO Study Says by Mike Ives. The New York Times, September 27, 2016. New WHO figures suggest the vast majority of us are compromising our health by breathing bad air. Study Links 6.5 Million Deaths Each Year to Air Pollution by Stanley Reed. The New York Times, June 26, 2016. Air pollution deaths are far greater than previously supposed according to a new study by the International Energy Agency. UK air pollution 'linked to 40,000 early deaths a year' by Michelle Roberts, BBC News, February 23, 2016. Diesel engines, cigarette smoke, and even air fresheners are among the causes of premature death from air pollution. New Mapping Tools Show Just How Bad China's Air Pollution Really Is by Eliza Strickland. IEEE Spectrum, August 20, 2015. Detailed maps of air pollution could provide more incentive to tackle the problem, researchers hope. This Wearable Detects Pollution to Build Air Quality Maps in Real Time by Davey Alba. Wired, November 19, 2014. A wearable pollution gadget lets people track their exposure to air pollution through a smartphone app.